This is my 18th installment of Babywearing Stories 365. Each installment features a babywearer in 1 photograph and their answers to 5 questions. My goal is to normalize, promote and celebrate daily Babywearing, moving beyond *what* we use to carry our babies and shifting focus back on *why* and *where* we carry. I hope to share the stories of moms, dads, and babywearing caregivers all over the world. Enjoy! My name is Hannah and I am wearing my 4 month old son, Max. The photo was taken by my Mom, Heidi. We took this photo in my parents’ home in Lafayette Hill, PA, in my parents’ bedroom. I’m wearing an Ergo baby carrier that I purchased used on Craig’s List. I had a hard time figuring it out when Max was a newborn (even with the newborn insert!) 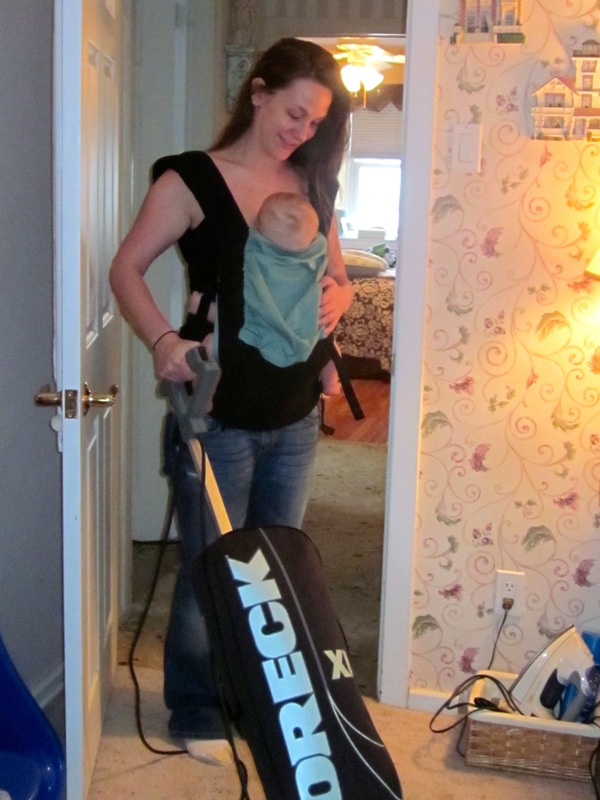 After another mom showed me how to use the Ergo properly, I’ve found it very useful! I have several other baby wearing “devices” but this one really takes the weight off my neck and shoulders. Max is already 16lbs, so I need all the help I can get! This was taken while my mom and I were doing some house cleaning. The sound of the vacuum put him to sleep! At first I was feeling busy because I had so much to get done, but once I put him in the carrier I was able to whiz through things! We took this photo on a snowy/rainy afternoon, on March 16, 2012 at 1:30pm. Max loves to be cuddled and kept close. It was much easier to get chores done while wearing him. I had minor surgery on my back the day before, and was unable to hold him across my arms. Wearing the Ergo took the pressure off my incision in the middle of my back, while still allowing me to hold my son. I enjoy baby wearing because I often don’t have another set of hands around during the day. My husband has been serving in Afghanistan since September, so it’s often just Max and I around the house (although my parents have been VERY helpful!) I enjoy baby wearing, but I’m very excited for my husband to come home in a few weeks so he can finally get to meet our son, and take him off my hands every now and then!